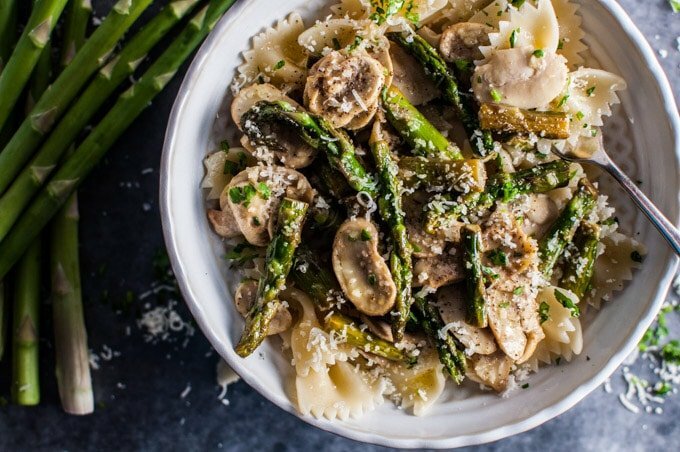 This asparagus and mushroom pasta is a healthy, light, and super flavorful meatless dish that comes together quickly and tastes like spring! Well, as I type this, it’s snowing outside. It does that a lot here. We’ve been spoiled this winter, but I still can’t stand the cold white stuff falling from the sky. I’m a meat and potatoes kinda guy, so I was quite surprised just how much I enjoyed this pasta dish. I have a bit of a hate on for farfalle (bowtie) pasta. When I was an obnoxious teenager, my mom made me spaghetti and meatballs with bowties instead of spaghetti. Being the budding gourmand, I threw the biggest hissy fit because HOW DARE SHE FEED ME BOWTIE PASTA WITH MEATBALLS, and I subsequently got myself banned from that spaghetti and meatballs recipe for like 10 years. Good times. Why did I choose bowties for this recipe? Because I want to re-live those repressed memories. …No, I just thought it would look pretty in photos. You can choose any kind of pasta you want. Feel safe in knowing that. Boil a large, salted pot of water for the pasta; make the sauce while the pasta cooks. Sauté the asparagus pieces in butter and olive oil in a skillet for 5 minutes; add mushrooms and cook until softened. Add garlic, lemon juice, and salt & pepper. Drain pasta (optional: reserve a little pasta water to toss with the sauce) and serve the sauce over pasta. Serve with freshly grated parmesan cheese. Delish! 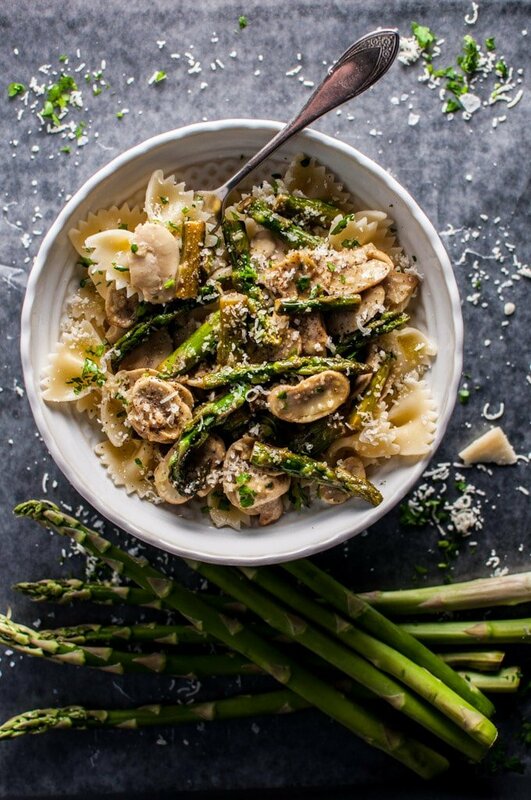 Will you make this healthy asparagus and mushroom pasta recipe? A fast and delicious vegetarian pasta dish that is perfect for spring. Love asparagus? You may also like my healthy asparagus and shrimp pasta. Gosh your photos are beautiful! This is perfect for Spring! Looking really good Natasha! I’m a huge fan of this ingredient list. Believe it or not, I was just having a conversation about gaining a few, ahem, pounds since I started food blogging. As luck would have it, I happened to see your new post this evening. I may have to begin including more health conscious recipes on my blog. It’s for this reason, I appreciate the “optional” freshly grated Parmesan cheese in your recipe. I wonder if this happens a lot. I remember reading on a blogger’s “About” page that they now write healthy recipes because they gained 20 pounds since they began their blog. I didn’t think much of it, but I have a funny feeling I’m going to have to start jump roping again. Anyway, this looks like a really great recipe and I’ll certainly give it a shot. Thanks for sharing and perfect job, as usual, with your extremely attractive photos! Thanks for the thoughtful comment, Jay! Gaining weight has definitely been a concern of mine as well. I’ve tried to closely monitor my portions since I started the blog, especially if I’m creating a series of recipes that aren’t the healthiest! It’s definitely a challenge sometimes. Can we grate the Parmesan (or Pecorino Romano) directly on to the served plate. Grated cheese loses its aroma incredibly quickly and if you have a wedge of cheese and a grater to hand, why not? Made this tonight for dinner for my husband and I and it was delicious! Simple, fast, healthy, and flavorful. Can’t ask for more than that! Thank you for a great recipe. Made this tonight with some leftover chicken sausages, it turned out awesome. Delicious, thank you for the simple recipe. You’re welcome, Tim! So glad you enjoyed it. Thanks for the inspiration Natasha, I melted paprika into a famous irish butter and added fresh thyme. Sorry forgot to give you my stars! This sounds very yummy and easy to make (2 top criteria for me!) but I think you left out a step – you should remove and discard the woody ends of the asparagus. I also suggest reversing the cooking order, as if you cook the asparagus first it’ll get very soft and mushy by the time the mushrooms are done. I think it will work better if you saute the mushrooms until golden and then add the asparagus, cooking until al dente (2 – 3 minutes). Reserve some of the pasta water and add it and some more butter to the pan, to create a sauce. Anyhow, I plan to try this tonight, over gnocchi. Thank you for the great ideas. Hi Edith! Good point – this was one of my earlier recipes, and I’ll add in a note re: the asparagus ends (I usually include it in my asparagus recipes these days). It worked well when I prepared it, but feel free to cook it in the order you prefer. Over gnocchi sounds fab! I’m planning on making this today for Easter. I’m going to try this tonight but will add sliced grilled chicken breasts for some extra protein for my hubby, sounds delicious! Hope you love it, Sarah! Thanks for a quick, easy, and delicious entree! I made it vegan using Miyoko’s Vegan Butter and a cashew and nutritional yeast substitute for the cheese. We loved it! So happy to hear that! Thanks for letting me know, Dianne! This was very tastey and so easy to toss together. I added some cooked chicken and added the cooked pasta to the pan and a little pasta water to thin it out. It turned out great and hubby liked it too.